This week, we’re taking a closer look at the three videos we released for free, during the NAB conference in Las Vegas last week. Be sure to toggle the viewer’s full-screen mode! This video is a perfect example of the stereoscopic/3D effect created by Iris videos. The effect is created as the video points, shoots, and holds areas of interest, while the International Space Station travels far overhead. The Giza Pyramid Complex sits on the west bank of the Nile River in northern Egypt, a 30-minute drive from Cairo. The Great Pyramid, the oldest ancient World Wonder, towers over the much smaller but equally impressive Great Sphinx, which you can locate here at the bottom of the frame. The Complex arrangement is entirely by design, as the Great Pyramid’s four sides correspond to the cardinal directions, with each side measuring ~230m. Contrary to popular belief, there’s much evidence to suggest that the structures within the Giza Pyramid Complex were not built by slaves, but rather by privileged workers. Cape Town’s natural topography is often lauded as a gift from Mother Nature. Focused on the coast of Green Point, a Cape Town suburb, this Iris video shows waves rolling into the coastline near Mouille Point. 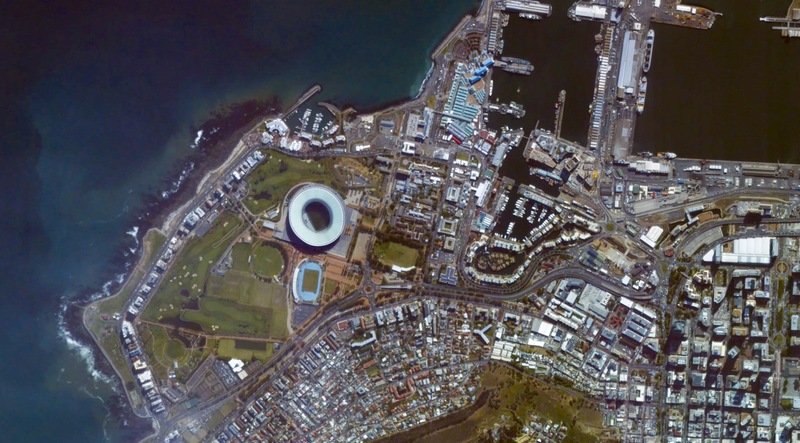 You can also spot the home of the Ajax Cape Town F.C., Cape Town Stadium, which was built for the 2010 FIFA World Cup. To download the videos, visit freeuhd.urthecast.com.